Minamiaoyama Eye Clinic offers both cataract surgeries with monofocal IOLs (intraocular lenses) and cataract surgeries with multifocal IOLs (bifocal intraocular lenses) that also treat presbyopia. 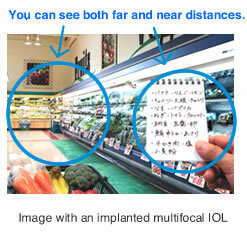 Multifocal IOLs replace opaque lenses to restore transparent vision and the ability to adjust the focus on faraway and nearby objects, thereby treating presbyopia. Value-added multifocal IOLs are recommended for those who desire more comfortable vision without having to wear glasses after undergoing cataract surgery. Our ability to ﾂ“adjustﾂ” the focus to see both faraway and nearby objects begins to decline gradually from about 40 years old. This decline in the ability to focus due to the hardening and decreased elasticity of the lens in the eye is what we call presbyopia. In addition to presbyopia, age-related changes to the lens include a white opaque condition called cataract. In the initial stage, this lens opacity creates the scattered reflection of light, leading to glare even in patients who otherwise have good visual acuity. Some patients who think their vision is affected by presbyopia may also have cataracts. 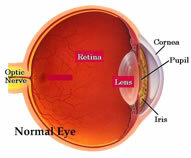 As the opacity increases, more light and images are blocked from reaching the retina, resulting in failing vision. This affects daily life and requires the surgical removal of the cataract. In cataract surgeries, the surgeon removes the opaque lens and implants a transparent artificial IOL. There are two types of IOLs: monofocal IOLs and multifocal IOLs. After receiving cataract surgery to one eye, the patient is observed for about one week before undergoing surgery to the other eye. Patients will receive a detailed eye exam including a test to determine the power of IOL necessary. Based on the results, patients will receive detailed instructions regarding what will take place during the surgery, a briefing on preoperative precautions and other information. The important exam that determines the power of the IOL is repeated. After administering local anesthesia, the surgeon makes an incision at the limbus of the cornea, from which surgical instruments are inserted to remove the opaque lens. Subsequently, the surgeon inserts an IOL to conclude the surgical procedure. three years, five years and ten years after surgery. Monofocal IOLs offer no focal adjustment function and have only a single focus point. Patients implanted with monofocal IOLs have the same presbyopic condition as before the surgery. If the implanted lens is set for better distant vision, then the near vision suffers. Conversely, if the lensﾂ’ focus point is set for near distances to allow reading books or computer screens, a patient will have trouble watching TV or recognizing acquaintances when passing them on the street. Therefore, eyeglasses will be required after surgery. Setting the focus for far distances achieves clear far vision. Eyeglasses will be needed because setting the focus for far distances results in poor near or intermediate distance vision. Multifocal IOLs are designed based on a cutting-edge optical theory for distributing light in such a manner that provides multiple points of focus, thereby eliminating the dependence on eyeglasses in daily life. However, for very far away landscapes or fine print, eyeglasses may still be needed. Minamiaoyama Eye Clinic offers the following multifocal IOLs: Acri.Lisa by Acri.Tec (Germany), ReSTOR by Alcon (U.S.A.) and ReZoom by AMO (U.S.A.). Acri.Lisa can also correct astigmatism. Acri.Lisa is designed to distribute 65% of the light to far distances and 35% to near distances, making it possible even for those with a small pupil size to see objects both far and near. The proprietary shape of the lens that Acri.Tec developed reduces glare and blurring. Astigmatism lenses are also available for the concurrent correction of astigmatism. ReSTOR has a multi-tiered surface rising in concentric rings in the central 3.6 mm zone that distributes light for both far and near distances. The margin of the lens is designed for far focus and directs light to a distant focal point when the pupil diameter is wide. This reduces the sensation of darkness at night and light blurring such as halos and glare. ReZoom has three far vision zones and two near vision zones (they are in the order of far, near, far, near and far zones from the center). The lens center region is designed for far focusing, ensuring far vision even when the pupil size is small in bright light. In addition to far and near vision, light is also distributed for intermediate distance focus in situations such as doing computer work or cooking. In daily life, after undergoing surgery patients will be able to see both far and near to some extent. Multifocal IOLs also offer the potential for correcting astigmatism. Better vision may be achieved with the addition of eyeglasses where needed. on one eye is about 50,000JPY (The case of using the insurance card of Japan).